One of Watson Lab's two Aberdeens. Photo: Courtesy of Eric Hankam (pictured). Click image to magnify (900K). Sometimes called the missing link between punched card equipment and the stored-program computer , the IBM Pluggable Sequence Relay Calculator (1944) was a special-purpose punched-card calculator originally developed by IBM for the United States Army for calculating artillery firing trajectories. 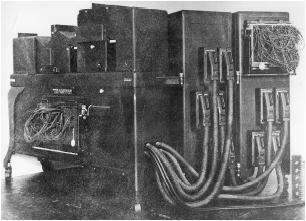 This machine, "which was capable of performing a sequence of up to fifty arithmetic steps, was specified by Columbia's W.J. Eckert and designed and built by a team led by C.D. Lake and B.M. Durfee" (Campbell-Kelly reference below), who had previously worked on the Mark 1. And Don Piatt who, with Ben Durfee, would go on to work on the SSEC . In its time, the IBM Relay Calculator was considered on a par with ENIAC and the Bell Relay Calculators . 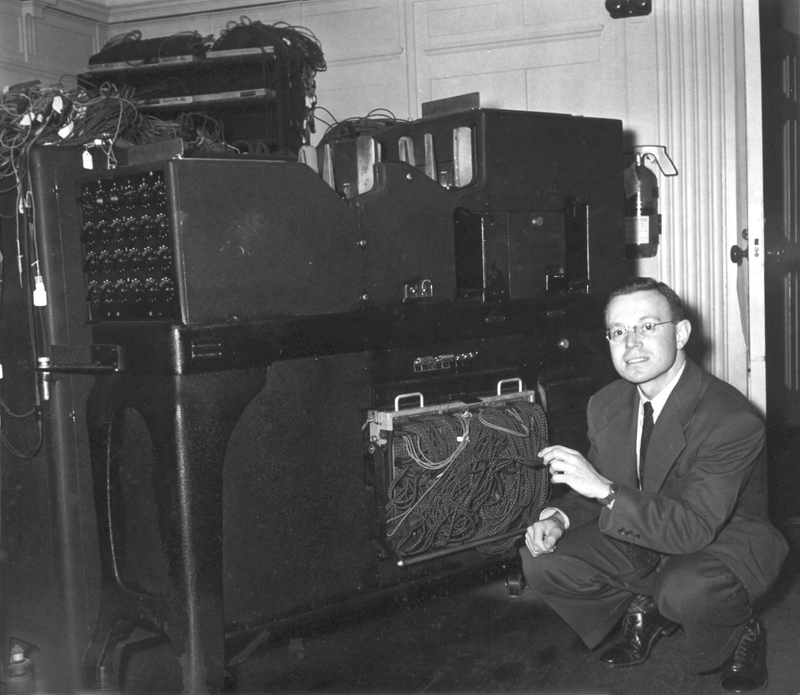 In fact, neither ENIAC nor the Bell Model 5 were delivered until after the war ended. I've been looking for confirmation that Eckert specified or was otherwise involved with the development of the Aberdeens, but so far all I've found is a suggestive quote from a Mr. Orton of IBM, in some introductory remarks to an Eckert lecture at IBM in Endicott in September 1944: "I first met our guest [Eckert] on an occasion some months ago when he was here in connection with special machines being developed by IBM and under his direction for purposes of the work he carries on in the United States Navy..." The timing is right but the reference might also be to Eckert's card-programmed table printer. (For more on this, CLICK HERE). These are the fastest relay calculators in operation; they perform six multiplications a second together with a great deal of addition, subtraction, reading, writing and consulting tables. They are not as elaborate as the Sequence Calculator at Harvard in that they have less storage capacity and less sequencing facilities; however, they are about twenty times as fast. Consequently, for those problems which can be handled in this way, they will do in one day what the Sequence Calculator will do in twenty days. Besides the two units delivered to Aberdeen, three more were built: two for Professor Eckert's Watson Scientific Computing Laboratory at Columbia University , delivered in September 1946 (one of these is pictured top left), and one for the Navy Proving Ground at Dahlgren, Virginia (replaced by Watson Lab's NORC supercomputer in 1955). 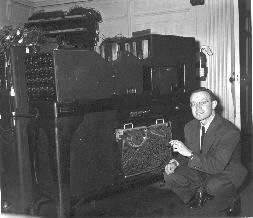 Photo:  The Aberdeens were by far America's fastest digital calculators, capable of 24,000 6x6 multiplications per hour, 30 times faster than the 601 , and capable of "multiplication of harmonic series, matrix multiplication, and solution of 6th order differential equations" . Each machine had 28 counters and had a control panel allowing up to 2000 different connections. The Watson Lab machines were able in two months to predict the 1947 positions of all 1500 known asteroids, filling the gap between the destruction of Heidelberg and the resumption of annual calculations in Cincinnati and Leningrad [57, p.81]. Their architecture was based on punched card equipment, but during each machine cycle (i.e., during the reading of a card, which took about half a second), the machine could execute a sequence of up to 48 steps, controlled by a sequencing device called a "hub." It was also possible to execute a "double cycle," with the feeding of the next card held until all operations were finished. Control signals at each "sequence point" on the hub were transmitted to four other hubs, so the machine could carry out up to four parallel arithmetic operations (even more if these hubs were in turn connected to other hubs). Picture a looming black monster, filling a six-foot cube when closed. The front part was a much-modified 513 reproducer - two hundred-a-minute card feeds and two stackers. There were two double-panel plugboards dripping with wires, on the front, and a panel of numerical switches on the right end. Hinged to the back of the punch was a dour box of thousands of Lake relays, and hinged to that a second box. The covers were usually off for diagnosis, although the un-air-conditioned and otherwise corrupted Morningside Heights atmosphere was full of dirt1. There was a special oscilloscope cart nearby, to check timings and look for contact bounce. And lots and lots of thick cables. Cards were read and punched at either feed under plugboard control: 16,000 decimal digits a minute at full bore. Calculating speed was dependent on the mix of operations: division and square root - yes, square root! - took almost a whole card cycle, while two or three six-digit multiplies or half a dozen faster operations could be fitted into the same. Besides, the Aberdeens could buzz away for several cycles without feeding or punching at all, but the plugboards got awfully complicated. On balance, each machine problem-in-problem-out ran six or seven operations a second. 1. Until the 1970s, NYC apartment buildings burned coal and incinerated their own trash. Herb Grosch points out, "The experimental machines that fill the history books didn't even get fired up until the end of the [1940s], and had very little input or output capacity. Until 1949, it was places like Aberdeen and the Watson Lab - including the SSEC - that were crunching the numbers; the Los Alamos and tin airplane boys didn't have big machines, and the computers being built in Britain and the U.S. weren't ready" . Campbell-Kelly, Martin, "Punched Card Machinery", Chapter 4 of Aspray, William (Ed. ), Computing Before Computers , Iowa State University Press, ISBN 0-8138-0047-1 (1990), p.149. I have not yet been able to substantiate or refute the claim made here as to Eckert's key role in the development of the Relay Calculator. Ceruzzi, Paul E. "Crossing the Divide: Architectural Issues and the Emergence of the Stored Program Computer, 1935-1955", IEEE Annals of the History of Computing , Vol. 19 No. 1 (1997). Eckert, W.J., "Facilities of the Watson Scientific Computing Laboratory", Proceedings of the Research Forum , IBM, Endicott NY (1946), pp.75-80 . Eckert, W.J., "The IBM Department of Pure Science and the Watson Scientific Computing Laboratory", Education Research Forum Proceedings , IBM, Endicott NY (1947) . W.J.E. (Wallace J. Eckert), "The IBM Pluggable Sequence Relay Calculator", Mathematical Tables and Other Aids to Computation , Vol.3, No.23 (Jul 1948), pp.149-161. Krawitz, Eleanor, "The Watson Scientific Computing Laboratory: A Center for Scientific Research Using Calculating Machines", Columbia Engineering Quarterly (Nov 1949). Levin, Joseph H., "Use of the IBM Relay Calculators for Technical Calculations at Aberdeen Proving Grounds", Proceedings, Scientific Computation Forum , IBM, New York (1948), pp.101-104. Lotkin, Mark, "Remarks on the IBM Relay Calculator", in Hurd, Cuthbert (ed. ), Proceedings, Computation Seminar , IBM, New York (Dec 1949), pp.154-157. Lynch, J., and C.E. Johnson, "Programming Principles for the IBM Relay Calculators", Ballistic Research Laboratories Report No. 705 , US Army Aberdeen Proving Ground (Oct 1949), 95pp. Hausman, L.F., and M. Schwarzschild, "Automatic Integration of Linear Sixth-Order Differential Equations by Means of Punched-Card Machines", Watson Scientific Computing Laboratory and Rutherford Observatory Columbia University. New York, N.Y., The Review of Scientific Instruments, Vol. 18 No. 12, December 1947. This article, discovered in July 2010 by Dave Caroline, is about the "new special I.B.M. relay calculators at the Watson Scientific Computing Laboratory"; it can be seen at the American Institute of Physics Scitation website. Memoirs of George Trimble (but note that Trimble's assertion that APG's connecting the two Relay Calculators was secret is false; see the Lotkin reference above, in which this was described at the 1949 IBM Forum) (*). I just ran across your description of the IBM Relay Calculators as a result of doing a search. I note that you said "but note that Trimble's assertion that APG's connecting the two Relay Calculators was secret is false". I did not say it was secret but did say: "On a visit to Aberdeen in November 1996 to celebrate the 50th Anniversary of the ENIAC, I found that no one there was aware that these two machines had been joined together, much less what had been done on the joined machines." The basis for my statement was that the Aberdeen Archivist mentioned the IBM Relay Calculators at the meeting and that they had been joined together but no one at Aberdeen knew what was done with the joined machines. Apparently everyone who knew anything about the joined machines was no longer at Aberdeen. Obviously the Archivist was aware that they had been joined but he knew nothing about how it worked or what they were used for. I told him after his talk what I had done on these calculators. Some of the applications I developed for data reduction to get trajectory data for the rockets fired at White Sands were programmed for the IBM Relay Calculators, both individually and joined, as well as for the ENIAC, Bell Relay Calculators, and IBM CPC I. I did a lot of experiments using curve fitting (polynomials) to smooth the trajectory data. The joined IBM Relays was one of the computers I used at that time. There are several references to the use of the IBM Relays in various BRL reports that I wrote including my curve fitting experiments. 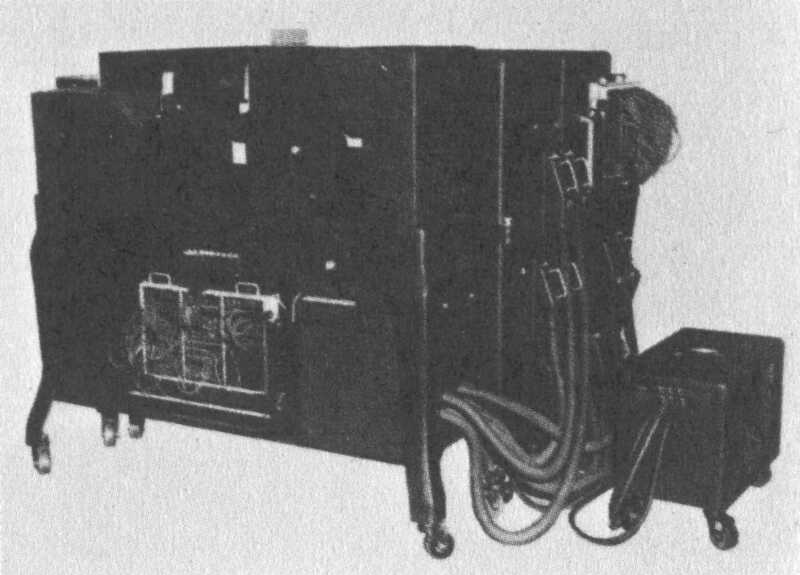 C. E. Johnson, who is referenced in Mark Lotkin's article, was the APG engineer who did the great bulk of the work on joining the two machines. I spent a lot of time with him so that I could know exactly how it worked for when I would get the opportunity to use them. I enjoyed reading your description of the Relays. I have not found a decent description of them anywhere and I do not have a copy of the BRL Report 705. It has brought back memories of those ancient times.